Intel Core i7-2640M 2.8Ghz 4MB Cache Socket G2 Laptop CPU PN: SR03R. Condition is Used. Shipped with USPS Priority Mail Padded Flat Rate Envelope. FF8062700838905 is an OEM/tray microprocessor. FF8062700838905 . Core stepping?. J1 (SR03R). CPUID 206A7 (SR03R). Socket Socket G2 / rPGA988B. Floating Point Unit Integrated. Maximum turbo frequency 3500 MHz (1 core). Model: i7-2640M 2.8GHz Dual-Core (SR03R). Summary: 1 CPU. Sold as used and in working condition. Condition: Used, fully functional (may have silver paste on it). CPU sSpec SR03R. Try another slot if it does not work. Trending at $47.72eBay determines this price through a machine learned model of the product's sale prices within the last 90 days. The sale of this item may be subject to regulation by the U.S. Food and Drug Administration and state and local regulatory agencies. If not, then we don’t. If an item is labeled “Local Pickup Only”, you may pick up the item from our warehouse or arrange a freight pickup. Part number: SR03R. The order cannot be combined or modified after checkout has been completed. checkout before your order will be cancelled. Puerto Rico or Virgin Islands. Check double check and cross check IF YOUR Laptop motherboard can support i7 cpu and if the cooling system can handle. This module is very specific to model version but can be used on others i cannot provide information about compatibility on others than the original. We will try to help or resolve any problem. Secondary Identifier: SR03R. Part taken from a good, working Dell Laptop. Need Help Deciding Which Part to Buy?. Product Details. Num Of Pins: 988. F S B: 650 MHz. Speed: 3.5 GHz. Stepping: SR03R. 1 x I7 2640M Processor. Model number: I7 2640M. The number of CPU cores: 2. Processor Speed: 2.8GHz. Processor Socket: Socket G2 / rPGA988B. new arrival. New Samsung GALAXY Tab A 8.0 P350 LCD Display Touch Digitizer Screen Assembly. Core stepping J1 (SR03R). CPUID 206A7 (SR03R). Socket Socket G2 / rPGA988B. Type CPU / Microprocessor. CPU part number. Floating Point Unit Integrated. Processor core Sandy Bridge. The number of CPU cores 2. We want to radically change the consumption cycle and do our part in tackling the e-waste problem. Old Made New! The weight of any such item can be found on its detail page. Core stepping?. J1 (SR03R). CPUID 206A7 (SR03R). we specialize in computer accessories and so on. Processor core?. Sandy Bridge. We will provide you best service and high quality products. The number of CPU cores 2. 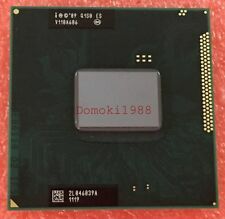 Power:35 W; Item Condition:Used; CPU Frequency:2.8 GHz; Main Frequency:2.8GHz; Processor Type:Intel Core; Number of Cores:Quad-Core; Type:Dual-Core; Interface Type:Socket G2 / rPGA988B; Chip Process:32 nanometers; Brand Name:Intel; L3 Cache Capacity:4 MB; Processor Brand:Intel; Package:No; Model Number: i7-2640M; 64-Bit Support:Yes; Application:Laptop; Socket Type:Socket G2 / rPGA988B; Socket Type:i7 2640m; Intel Model:i7 2640m; Intel Model:i7 2640m; warranty:1 year; L2 Cache:≤ 1MB;. FF8062700838905 is an OEM/tray microprocessor. FF8062700838905 . Core stepping?. J1 (SR03R). Type CPU / Microprocessor. CPU part number. The number of CPU cores 2. Processor core?. FF8062700838905 is an OEM/tray microprocessor. Part number SR03R. FF8062700838905 . Core stepping?. J1 (SR03R). CPUID 206A7 (SR03R). Bus speed ?. 5 GT/s DMI. Stepping: SR03R. Model number: I7 2640M. 1 x I7 2640M Processor. Processor Speed: 2.8GHz. Processor Socket: Socket G2 / rPGA988B. The number of CPU cores: 2. L3 cache size (MB): 4 MB. DO NOT send without communication. Stepping: SR03R. Model number: I7 2640M. 1 x I7 2640M Processor. The number of CPU cores: 2. Processor Speed: 2.8GHz. Processor Socket: Socket G2 / rPGA988B. We will try our best to solve for your problem. Stepping: SR03R. 1 x I7 2640M Processor. Model number: I7 2640M. The number of CPU cores: 2. Processor Speed: 2.8GHz. Processor Socket: Socket G2 / rPGA988B. 16PCs Easier Shoelaces Elastic Silicone Flat Shoe Lace Set for Kids /Adults .